The populace by way of vote or similar influence can set or change the powers that be-providing for incredible life improvement or changes for millions. The varying personalities and backgrounds of leaders have led to greatness and demise. The choice of leadership or politicians in Florida is critical to the future of our State and Nation and it’s in the hands of voters. The major issues in Florida have been around in some form or fashion forever. As we look back over time we have witnessed incredible shifts, disruptions or accomplishments in world matters by way of who’s in power. Decisions and actions are memorialized in our text books, eBooks, and now Wikipedia online. Not surprisingly, the issues we face, challenges of today have been dealt with, or not, with success, failure and inaction in the past. Issues in Florida-Politics-such as: climate change, medicine, healthcare, taxation, minimum wages, growth management, immigration, public pensions, education, transportation, use of resources, commerce, trade have been issues since the beginning of time and certainly at the forefront of our Nation and State for the last 100 years. Nothing new—it’s who we choose to lead, by way of registering to and actually voting that will, make the most progress on these on-going fronts. We remain at a critical time in this Nation and the State of Florida as to our choice of leaders, what we voice, civic participation, of this great Country and State will make the difference. The 12 million registered Florida voters must all take advantage of this incredible democracy we live in and exercise the privilege of voting. Vote, perhaps early, with purpose! 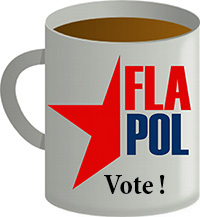 Update: Tuesday, November 4, 2014-Election Day–Today is the day! Go for it!